It was an interesting “first thing” to say in an interview after winning the NBA championship series and being named MVP, but there was Golden State Warriors Andre Iguodala thanking the National Basketball Associations team chaplains. 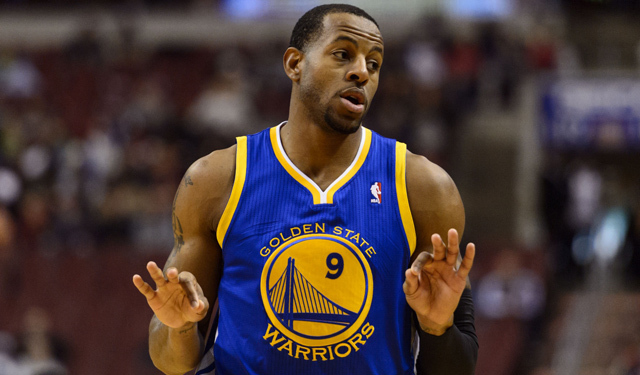 Check out this video where Iguodala thanks NBA chaplains. Not once, but twice, as Iguodala gives a word of praise and thanks for the chaplains that work with NBA teams around the league. A colleague sent me the video highlight which, I imagine, put a smile on sports chaplain’s faces everywhere. Our work is sometimes a lonely, thankless work. Let me explain what I mean and if you know a sports chaplain, I hope that you will thank them after reading this. The first reason to thank a sports chaplain is because of the tremendous amount of rejection. Let me encourage you, if you want to work in sports chaplaincy, you have to be ready to face rejection. Even for a chaplain and ministry that emphasizes a holistic approach to the person and works to foster a healthy environment where people of different faiths can feel comfortable and supported by the chaplains, there is always rejection that a chaplain faces. This is especially difficult when you simply want to be able to serve people, to love on them, to support them as best as possible and, yet, there are simply times when people and organizations do not receive a chaplain and the support they provide. Chaplains in sports chaplaincy also face a rejection of another kind – the majority of those who work in sports chaplaincy are faced with the challenge of raising financial support. In 2005, I surveyed my colleagues in Major League Soccer. Nearly 60% of the chaplains at the time were Athletes in Action (the sports branch of CRU). When I asked how much of their time was spent fundraising – the answer blew me away: 60% on average! After being at the work of trying to grow CrossTraining in just a few weeks since leaving the church, I am discovering that there is a lot of rejection to be faced when sharing the story and trying to find people who will get behind the mission and vision of the ministry and its work and while some sports teams and leagues supplement and support their team chaplain in MLS and other pro-soccer leagues in North America, this is not the case. Another reason to thank a sports chaplain (or chaplains of any ilk) is that chaplains often operate alone. Chaplaincy, by nature, is a work performed outside of the church, the parish. It is the work of protecting the sacred and caring for people outside of the typical bounds of the church. Chaplains don’t have the staff and resources and support (much of which I became very accustomed to in the large church where I served for 5 and 1/2 years). Even a solo pastor in a small church will often have some modicum of support – an elder board, musicians, volunteers, etc. Chaplains are often isolated and have to be really resourceful when it comes to doing the work and doing the ministry, especially in the professional sports environment. I’ll leave you with one final reason to thank a sports chaplain – just consider the sacrifice. First – the schedule. The MLB (Major League Baseball) tops all leagues with 81 home games (sports chaplains are typically involved in all home games with a pre-game chapel or prayer time). The NBA and NHL (National Hockey League) each play 41 home games in a season. MLS (Major League Soccer) has 16 home games (plus other competitions) and the NFL (National Football League) has 8 home games. While the MLB, NBA and NHL play games indiscriminately throughout the week and on weekends, the NFL and MLS primarily play on weekends. Some chaplains travel with the teams or are available to travel and many sporting events are held on national holidays for the entertainment value or tradition. These things often mean a sacrifice of family time for a sports chaplain. Another sacrifice is the financial sacrifice – apart from raising the funds to do ministry, many sports chaplains make personal financial sacrifices to do the work. For a number of years, the funds for ministry came out of my own family’s meager pockets. Being a seminary student with with only my wife working, some years we spent close to $4-5,000 to do the ministry work. Getting to come alongside of and work with people like these make being a sports chaplain worth it. There are many more sacrifices often made – whether career sacrifices or similar opportunities that are passed by. But if you ask anyone involved in sports chaplaincy, they wouldn’t have it any other way. They would tell you that it is worth it. They would tell you that the don’t mind the sacrifice – they are willing to make it. So, if you know a sports chaplain, let me encourage you to thank a sports chaplain. They (and you) will be glad that you did. Posted in From the Rev and tagged Andre Iguodala, Athletes in Action, chaplaincy, chaplains, CRU, From the Rev, MLB, MLS, NBA, NFL, NHL, pastor, Rev Brad Kenney, sports chaplaincy.